Love To Hug Your Dog? They Hate It And You Won’t Believe Why..
Dr. Stanley Coren, a psychology professor at The University of British Columbia and dog training expert says that contrary to what people believe, dog’s are very uncomfortable when being hugged. He takes it a step further and says that when hugged, your dog is in fact, miserable. Oh my, we can hear the uproar and the scores of pet parents who disagree with this completely. If you have the time, check out some of the reactions on twitter. Many of us (ourselves included) would argue that children enjoy getting hugs, and since pets are like little children (with fur) shouldn’t they love hugs as well? Dr. Coren says “no.” He points to the fact that dogs are “cursorial animals.” Which essentially means that they were born for swift running and that during stressful times or threatening situations, a dogs first inclination is to run away. 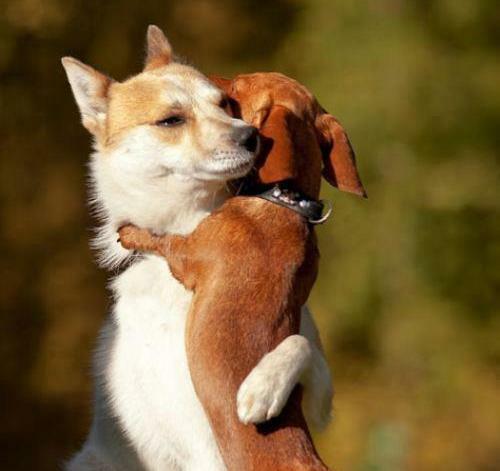 Dr. Coren took to the internet to prove his theory and looked at random pictures of people hugging their dogs. He observed 250 pictures. In order to keep his findings as succinct as possible, he only used photos where the dogs face was clearly visible. In addition, he says he eliminated photos in which dogs appeared to be in stressful situations. Dr. Cohen suggests that you leave the hugging to your human family members or lovers. And that a pat or a treat would be better. However if you choose to follow the good doctors advice, remember we are suffering from a pet obesity epidemic, where 52% of dogs are overweight. So be judicial when it come to snacks. The best part about this theory is that is it’s just a theory. Not a clinical study with peer-to-peer reviews. Meaning this is more of an opinion or observation rather than being based on scientific fact. So rest easy and if you’re pet is okay with it (and only you really know if they are) then reach over and give them a big ole hug. What are your feelings about hugging your dog? Comment below and don’t forget to share this article. ← Mom Was Right. Broccoli Is Good For You And For Your Pet…Or Is It?